As far back as April, 2006 we here at NotMakingThisUp reported on Microsoft CEO Steve Ballmer’s refusal to spring for iPods for his children, and his insistence that they not use Google. The danger of this line of thinking, we noted, was that a heretofore successful company thus cuts itself off from knowing what its customers want. Such a blinders-on, head-in-the-sand, not-invented-here mindset has heretofore been more closely associated with Detroit, where auto executives drive only their own company’s best cars. Small wonder the bigs at GM, Ford and Chrysler failed to grasp, before it was too late, the quality and innovation that allowed Toyota and other imports to eat their collective lunch. Little did we know that Steve Ballmer’s father once worked for Ford. Kevin Turner, chief operating officer…said he discouraged Microsoft’s sales force from using the iPhone… “What’s good for the field is good for Redmond,” Mr. Turner said, recalls one of the people who heard his comments. Mr. Ballmer took a similar stance at the meeting. He told executives that he grew up in Detroit, where his father worked for Ford Motor Co., and that his family always drove Fords, according to several people at the meeting. Ballmer’s father, of course, was not alone. All the car companies used to feed spanking-new, smokin’-hot, top-of-the-line models to ‘the suits.’ That’s why the suits never saw the Japanese coming. 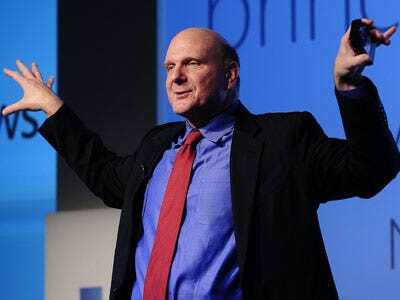 And Ballmer—like father, like son, it would seem—is doing the same for Microsoft. It’s been four years since we here at NotMakingThisUp flagged that intransigence as a potentially fatal flaw—and that was back when the iPod was the hot new product. Of course, the iPod long ago made Microsoft’s “Zune” music player as extinct as monks transcribing bibles. More recently, it is the iPhone that has been pushing Microsoft’s own smart-phone software off the shelves and into computer museums, where it belongs. Now, just this weekend, we ordered an iPad, and it’s only a matter of time before the Dell notebook on which we write these virtual columns will go wherever dead Zunes are buried. Seems to us that if Bill Gates is as smart as Warren Buffett thinks, and if Bill Gates really wants to see his legacy survive, he should buy Steve Ballmer an iPad and an iPhone and an iPod. And Steve Ballmer should use them all, to understand—really understand—what Microsoft is up against. Otherwise, Microsoft just might need to call Alan Mulally in a few years, to clean up the mess in Redmond. Mulally, for readers not familiar with the name, is the genius behind the recent Ford renaissance. Mulally’s very first act upon being named CEO by the Ford family? He drove every Ford in the lineup. This post is reprinted from Jeff Matthews Is Not Making This Up.